Alex Prunty Racing: Alex Choosen to be in the 2016 Alan Kulwicki Driver Development Program! Alex Choosen to be in the 2016 Alan Kulwicki Driver Development Program! Alex is honored to be chosen into the top 7 drivers for the Kulwicki Cup this season. He can't thank everyone around him enough for mentoring and supporting him the way they have! None of this would even be possible without his dad Dan Prunty, David Prunty, Dennis Prunty, Dale Prunty, Doug Prunty, Zach Prunty, Doug Prunty Jr., Matt Prunty, Joe Klemp-Hawig, Janine Prunty, Cierrah Flaig and all my sponsors who have done nothing but push me to succeed. We're looking forward to dropping the green flag on the 2016 race season Dells Raceway Park for the Icebreaker 100! Follow Alex Prunty Racing for updates all season long! CONCORD, N.C. – Officials of the Kulwicki Driver Development Program (KDDP) announced today the seven drivers who will represent the organization during the 2016 racing season. The seven drivers hail from six states spread from coast to coast. They range from 18 to 24 years in age. A member of the 2015 NASCAR Drive 4 Diversity Development Program, Decker heads back to the Midwest full time in 2016, competing in a super late model and running the entire ARCA Midwest Tour. In 2015, Decker became the first female to podium finish on the ARCA Midwest Tour. She claimed three feature wins at State Park Speedway and outdueled Kulwicki Development Driver Reagan May to pick up the victory in a thrilling photo finish at Golden Sands (Wis.) Speedway. Since 2012, Jeremy Doss has won 30 super late model races on the West Coast, including 16 in the Pacific Challenge Series, the most in series history. The son of famed California late model racer Mike Doss, Jeremy will compete for the PCS championship for the first time in 2016, and hit a number of prestigious races throughout the season, including the Montana 200 and the Snowball Derby. Doss finished a strong third in the recent Winter Showdown at Kern County (Calif.) Raceway. 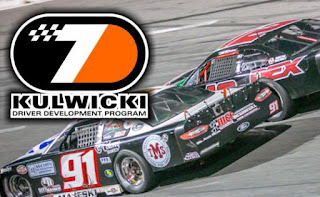 The only returning member of the 2015 Kulwicki Driver Development Program, Farrington won the prestigious Coastal 200 at Wiscasset Speedway and scored a number of top-five finishes at his home track, Beech Ridge Motor Speedway. The 2014 track (and NASCAR State) champion plans on chasing the championship at Beech Ridge again in 2016, as well as hitting a number of PASS North and ACT Series races. Farrington works at the Bath Iron Works in Maine, and helped build the US Navy’s newest destroyer, the USS Zumwalt. As the winner of the 2015 Rupert Porter Memorial 100 at Anderson (S.C.)) Speedway, owner-driver Cody Haskins proved he could beat two of the best in late model stock car racing in Lee Pulliam and Anthony Anders. Haskins, a multi-time pro truck winner, will compete for the 2016 NASCAR Whelen All American Series National Championship, racing over 40 times at various tracks in the Southeast. As one of the house drivers for Rob Fuller’s LFR Chassis team, Quin Houff raced super late models for the first time in 2015, picking up a huge breakthrough victory on the CARS Tour at Tri-County Motor Speedway and finishing fourth in the series points. His 2015 CARS Tour record also boasted five top-five finishes and seven top-10s. Houff plans on competing in races throughout the country in 2016, racing in CARS, PASS, and CRA competition. A member of the first family of short track racing in Southeast Wisconsin, Alex Prunty follows in the footsteps of his father and uncles and will attempt to take the super late model track championship at Slinger Speedway. Prunty won the late model championship in 2015 and was the SLM Rookie of the Year at Dells Raceway Park. A graduate of Moraine Park Technical College, Prunty will feature sponsorship from his alma mater on his cars this season. The son of former NASCAR driver Dennis Setzer, Brandon Setzer took the super late model world by storm in 2015, winning two races and three poles on the CARS Tour and picking up the prestigious Thanksgiving Classic at Southern National Motorsports Park. Setzer will chase the CARS Tour again this season, among other big SLM shows, and already has one win to his credit; a PASS South victory at Dillon Motor Speedway in early March. The 2016 season will mark the second fully-functioning year for the KDDP, which was established in 2014 by the family of late NASCAR Champion Alan Kulwicki for the purpose of helping worthy drivers toward reaching their dreams while at the same time keeping Alan’s memory and legacy alive. “I applaud our advisory board for doing another exemplary job in coming up with this great group of drivers,” said KDDP executive director Tom Roberts. “After reviewing all the applications, they were able to reduce the number down to 17 very worthy simifinalists. Those drivers were extremely impressive during the individual interviews that we held. “I think that the most important aspect of the process in determining our seven drivers for 2016 came in the final ‘open topic’ conference calls that our board had,” said Roberts. “During those conversations, I think several of the candidates were eliminated by their current plans to compete in racing at a higher level than local and regional touring series type competition. The seven drivers selected today will each receive a one-time stipend of $7,777 to cover operational expenses. The organization will work to provide the drivers assistance in important aspects such as publicity, marketing, sponsorship development and industry networking during the season as they compete for the grand prize “Kulwicki Cup.” That award winner will pick up an additional check worth seven times the initial prize ($7,777 x 7 = $54,439) and a special trophy. Seymour, Wisconsin’s Ty Majeski was the 2015 Kulwicki Cup winner during last year’s inaugural competition. The KDDP urges you to keep up with all of the organization’s news and activities by regularly visiting Speed51.com, the official media partner.